So this past weekend, I tried to get organized. One task I accomplished was to finally put away our tax documents. I couldn't resist looking again, trying to see where I went wrong. My numbers were almost exact on the entire return except for one line: Line 44. Tax computation. This is the sheet on how to do tax computation. 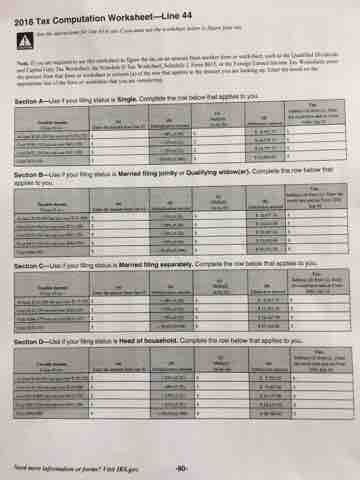 There are four main sections based on filing status (single, etc. ), and so you go to your section, and then figure out which income line to use, and then calculate. I made a very simple mistake and it was 100% clear in my notes. I took our joint income (we are married, filing jointly) and then pulled the tax calculation portion for married filing separately. The base percent calculation for married filing separately is way higher than married filing jointly. I guess they assume you have half the income and so the tax rate is very similar to single. Oops. I think when I looked at the headers on the sheet, I saw "married filing jointly or QUALIFYING WIDOW(ER)" and kind of skipped over the first part. We're not qualifying widow/ers, so on to the next section. "Married filing separately." Again, not reading very carefully, just saw the word "married" and must have decided that was us. Oh well, at least the mystery of what went wrong is solved in my mind.